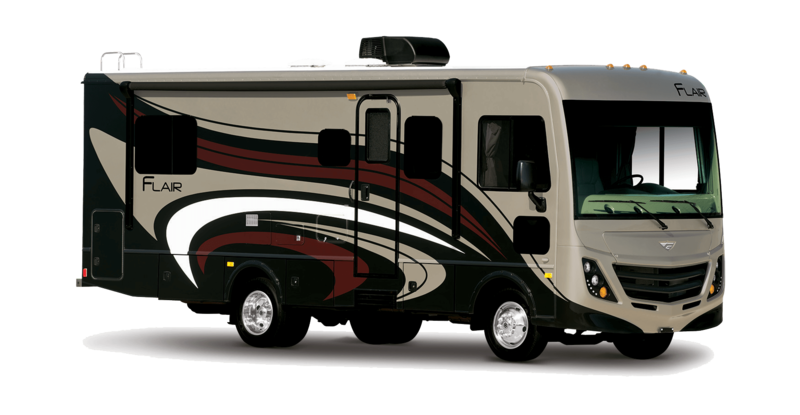 Fleetwood Flair is full of driver convenience and passenger luxury at every turn. Interior amenities include options like composite tile flooring, hardwood flat panel cabinet doors, central monitor panel and comfortable furniture. Drivers will love features like cruise control, remote heated power mirrors and side view cameras. Stay entertained in the living area with 32” LED wide-screen TVs and DVD players. The bathroom in the Flair will make you feel like you’ve never left home with Dometic China Bowl toilet, large residential sink, molded shower with tub and many other amenities.